Wholesaler & Trader of EPABX System & Panasonic EPABX System. Our product range also comprises of High End Projector, Short Throw Projector and LCD Projector. Handset Volume Control 4 Levels Electric vol. 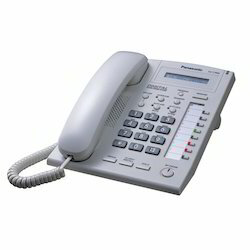 We are the prominent company for offering Panasonic EPABX System to the clients. This product is widely appreciated by our clients who are situated all round the nation. This product is appreciated for its excellent functionality and is free from defects. Lastly, we are able to deliver this within the specified time frame.